Here’s a quick little hack I put together to debug CSS on browsers w/o DOM inspectors, Firebug, etc. It’s pretty useful if you ever need to figure out why a co-worker’s Safari 5.1 on Lion refuses to acknowledge #fff on CSS3’d nav links. I mean, seriously, wtf, man. 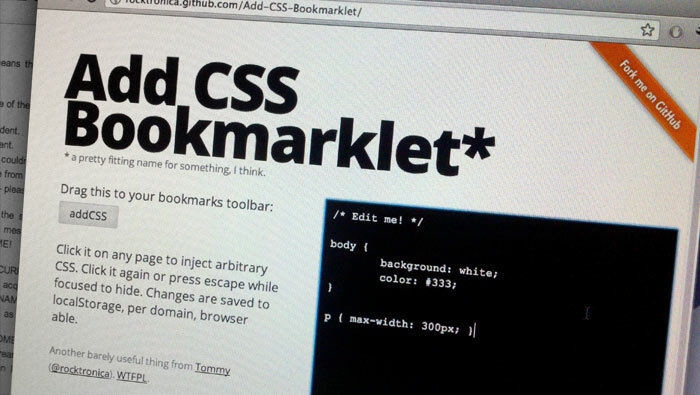 Uses jQuery and the skeleton bookmarklet code from the recently updated article I wrote for Smashing awhile back, Make Your Own Bookmarklets With jQuery. Like most things, it is not unlike other similar things, but it is my thing, so I like it. And I don’t even care if that’s a run-on sentence.